Tough Cookie expresses her displeasure at seeing the cut trees along the trail in Manchester’s Livingston Park. We have ignored the unusually cold weather and icy-crusted conditions in a desperate attempt to find an afternoon of hiking near our home. We settle on the trail around the pond in Livingston Park because that’s one place in our city we have not yet hiked together. We’re running out of such places in Manchester. “You need a mountain?” I ask, knowing the answer. 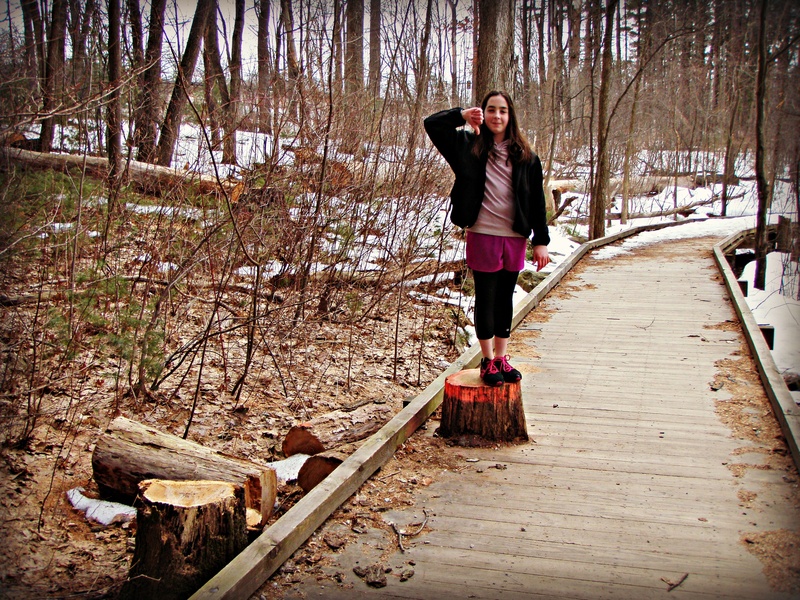 This has been a tough winter; cold, busy and, for Tough Cookie, fraught with the confusing and sometimes difficult obstacles of pre-teen angst, barely controlled energy and, well, just plain growing up. She’s committed herself to our book tour and presenting with me with as much discipline and focus as she did to hiking, but it’s not the same. She needs hiking, and climbing, and running, as a means of head clearing. Being outside has become her meditation, and if I am to be honest with myself, I just haven’t been able to give her as much as she’s needed. 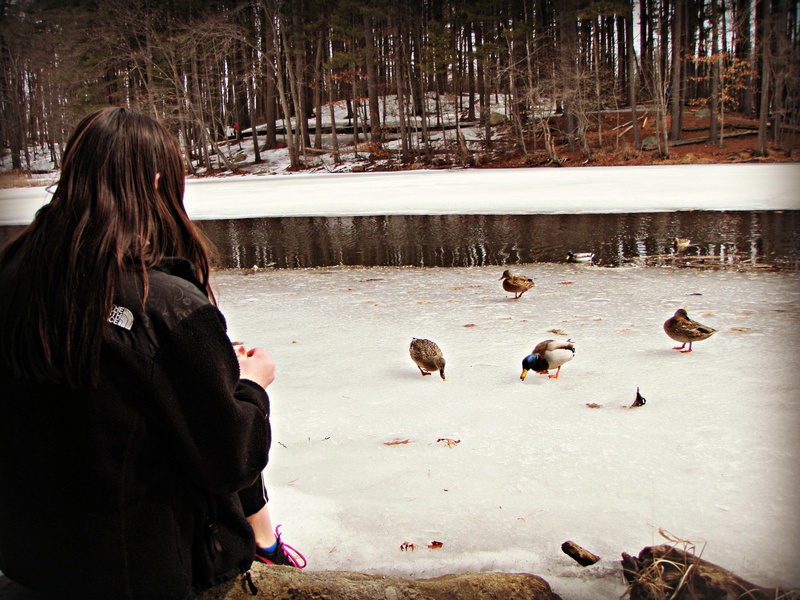 Feeding ducks on partially frozen Dorrs Pond. We swing around the small pond, slipping and sliding along on the icy, uncleared trail. We have big plans for the year: an overnight at Lonesome Lake Hut, a couple 4,000-footers on tap and maybe, if we can swing it, a thru-hike of the Cohos Trail. For now though, we satisfy ourselves with small hikes, local runs and occasionally an amazing event. 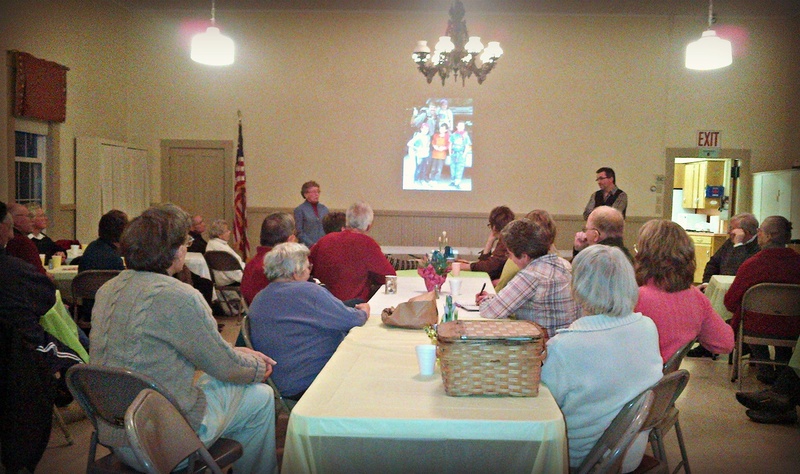 The experience of an old-fashioned New England pot luck social is something special. About 50 “Yankees” stopped by carrying delicate dishes of steaming, mostly homemade food. Everything from baked mac and cheese to boiled chicken to Ramen noodle salad to treats like blueberry pie covered two long tables. But the corn pudding, oh my! Throughout this adventure, I’ve often considered the direction this ongoing experience has moved us. From the timely circumstances surrounding the twins entry into our lives, to the hiking path that has created such an amazing bond between Janelle and myself, which ultimately led to the book, which in turn has created a sort of career path at just the moment I needed direction. Being introduced at the Willing Workers Hall. But sitting there in that old social hall, with Janelle and Meena, surrounded by a group of kind, attentive, comfortable new friends, I finally figured out what this whole endeavor has ultimately been about. And I’m here to tell you my friends, it is about corn pudding; creamy, sweet, perfectly baked, corn pudding. Before we left that hall, we befriended the amazing woman who brought that dish, and she kindly gave us her recipe. And now I know, no matter what the future brings, this incredible adventure – this earnest and deeply challenging quest for friendship that Janelle and I have undertaken with all of your love – does indeed have meaning. And that meaning can be found in a box of Jiffy Corn Bread Mix along with a couple of cans of cream corn. Salvation is not as difficult to find as one imagines and can thrive in the most mundane of places. Perfect happiness can be found in a simple social hall, surrounded by friends and a heaping plate of corn pudding. Spring has nearly sprung, and not a moment too soon! 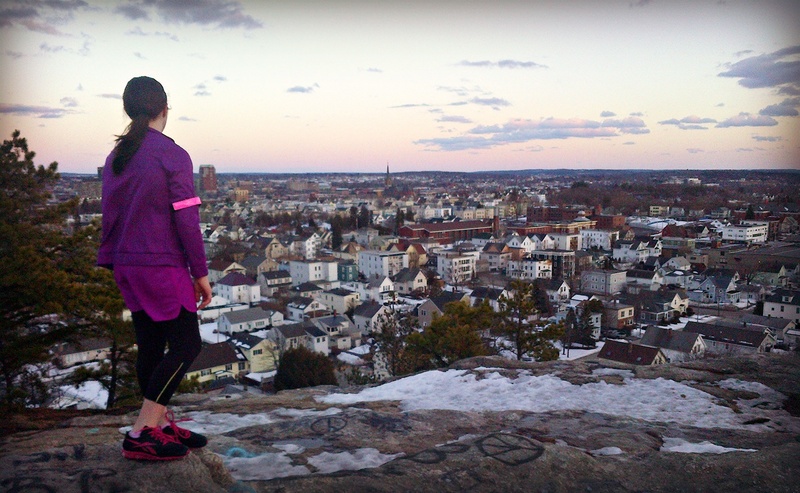 Pausing to enjoy the sunset from Rock Rimmon during one of our runs. 2014 will be the year of running! Happy (nearly) spring everyone. Yes, we have snow in the forecast for the weekend. And yes, it’s freezing outside right now. But we are not letting any of that reality get in the way of our plans for spring and summer adventures. Buffalo and Tough Cookie will be on the road for the book, giving talks and slide shows all over New England. But we also have some big hiking adventures planned as well. For some reason, Janelle has gotten it into her head that 2014 will be the year of running so we’ve already started getting outside when we can, doing a mile here and a mile there. The weather has been a little, shall we say, inconsistent, but the girl is already showing signs of that boundless energy she often displays on the trails. Even in our short runs, I’ve had to work to keep up. We’ll certainly participate in the Merrimack Rib Fest 5-miler in June and most likely run the Stonyfield 5k and Girls Inc 5k as well. Are you a runner? Come join us! Here we go! Let’s make this year unforgettable! Happy Friday all. We hope you have something wonderful planned for the weekend! I just wanted to drop a quick post about the New Hampshire Writers’ Project Reader’s Choice Awards. The Adventures didn’t win the Writers’ Project best of 2013 prize for non-fiction, but we are still in the running for the Reader’s Choice Award. So, I’m humbly asking for your vote to help push us over the top. Voting is easy and will only take a moment of your time. Just click on the link below, punch in your email and scroll down to the non-fiction category Click the oval next to my name then click SUBMIT and you’re done! Thank you so much in advance. Your support and enthusiasm has made all the difference! The gang gets goofy at Derryfield Park! Happy March friends! We are less than three weeks from spring, and working hard to get outside as much as we can before the mud arrives. I’ve been a bit distracted lately with the work and excitement of the new book coming out (The Nepal Chronicles) and have neglected this site somewhat. That, combined with Janelle’s schoolwork and other obligations have made it tough for us to really get outside and explore like we’ve wanted. 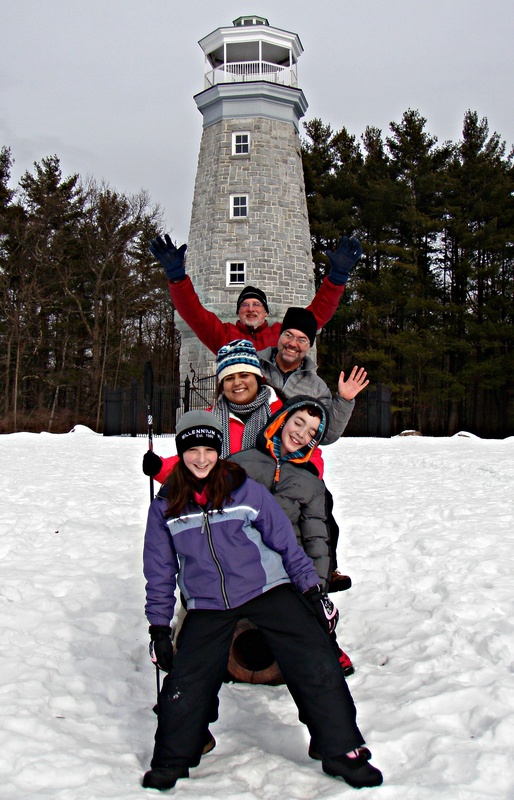 But we did manage to take the whole gang out to Derryfield Park Sunday for some hiking and sledding. 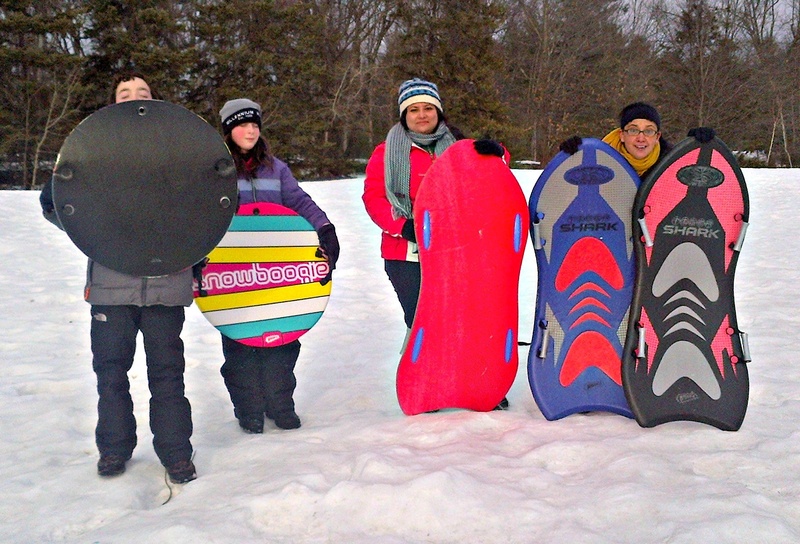 We spent the whole afternoon getting our bones rattled on the very fast and slick sledding run. Like lugers only without the padding, or sled, or you know, being athletic! Several hours and many bruises, bumps and ice burns later we happily called it a day with some dumplings and curry. Not a 4,000-footer, but man we all slept well! Just a quick note to let you know that March marks the beginning of our new touring season. Janelle and I will once again be crisscrossing New England promoting the book, getting our continuing story to our friends and fans and maybe even getting a little hiking in along the way. We have MANY events planned. Check out this link, and we’ll see you there: Dan and Janelle on the road. Meantime, what have you all been up to? It’s been a rough, cold winter for sure. Did you get outside at all? Is everyone safe? What plans have you if summer ever arrives? Talk to us! And we’ll see you on the road!